It's been a long time since I've mailed a trade package and I'm finally getting my... stuff together as promised. Monday is my day off this weekend and I'll spend part of it looking for cards for you and me. Please check this list below! If your name is supposed to be here but isn't, please tell me. Likewise, if you don't know why you're here, please ask! This is meant to be an exhaustive list after researching a year - or sometimes longer - back in my emails. 14,000 Phillies - I have some cards for you for a trade, almost everything you asked for! unclemoe - you wanted a DiamondBacks '12 CardGen set. Do you still want one? Jeff W. - I have stuff to send you whenever we finalize the trade. Dutch Card Guy - I owe you , and I think I have stuff to send you. Paul B. - I think I'm about halfway there for the trade, for the 20th Anniversary UD singles. Nachos Grande - I am looking for your stuff this weekend. Scott Crawford - I'm looking for what you wanted. Greg D - going shopping for you this weekend. Steve M. - I need to find the set still, this weekend. NPB Card Guy - I am expecting to find those magazines. If nothing else, I can order them from Amazon and make enough of an order to get free shipping. Kenny (Zippy Zappy) - I need 5 more cards for you. Jason P. - I have the Foreigners cards for you, and unless I hit gold this weekend I might be ready to mail. Again, if you should be on this list (it's highly possible) because we discussed a trade or I made a trade with you and still owe you cards, tell me! You won't insult me. I have some cards without owners. Namely, a lot of Braves and Phillies '12 CardGen (who did I get those for?!) as well as Verlander/Lincecum stuff (who likes both of them? I can't find you). I'll be emailing everyone individually next week (I hope!!!) to give you a full update. Please send me an email: rgluesing through gmail if you have questions or concerns about this list. And if you're interested in anything and want to do a trade, please let me know so I can look for stuff for you at the same time! I'm currently on vacation. 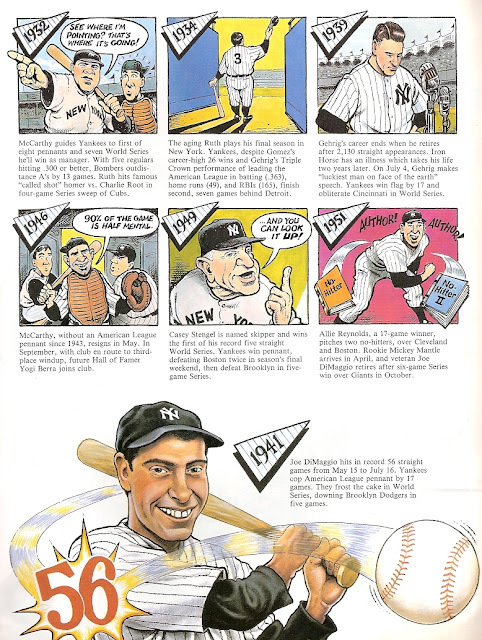 I figure this is a good time to share more from Red Foley's Cartoon History of Baseball. As I've mentioned before, I wish they would update the book - and sell it in trading card form! Today, we look at the Texas Rangers. 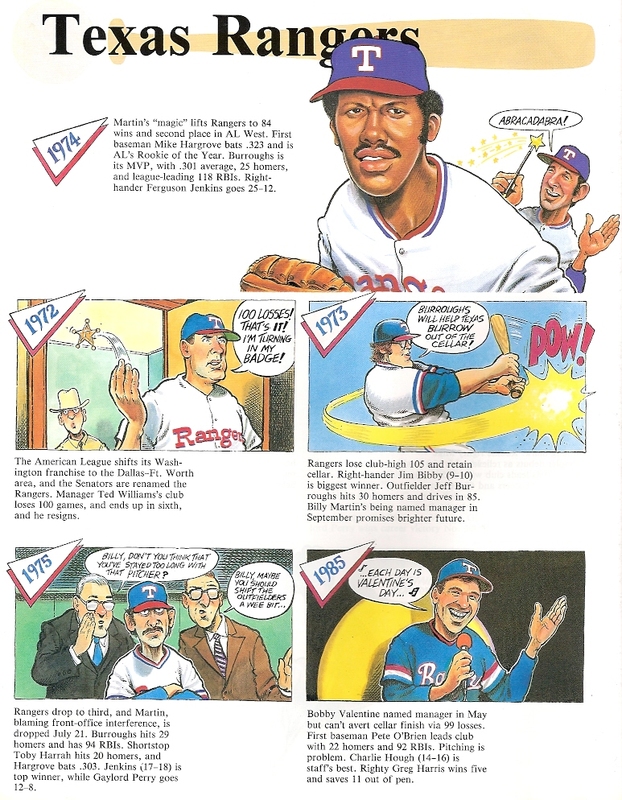 The Rangers, like my Mariners post yesterday, don't have too long of a history. They, too, only receive ten panels, though they are more creative. 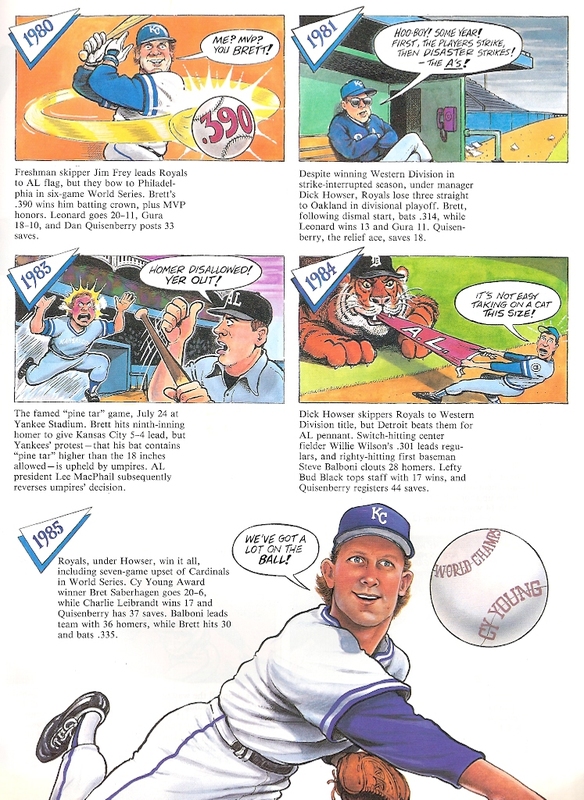 I like the 1988 panel. But the first one is fun, too. Abracadabra! I should be back tomorrow with more actual cards. I hope you've enjoyed my posts this week! I'm currently on vacation. I figure this is a good time to share more from Red Foley's Cartoon History of Baseball. 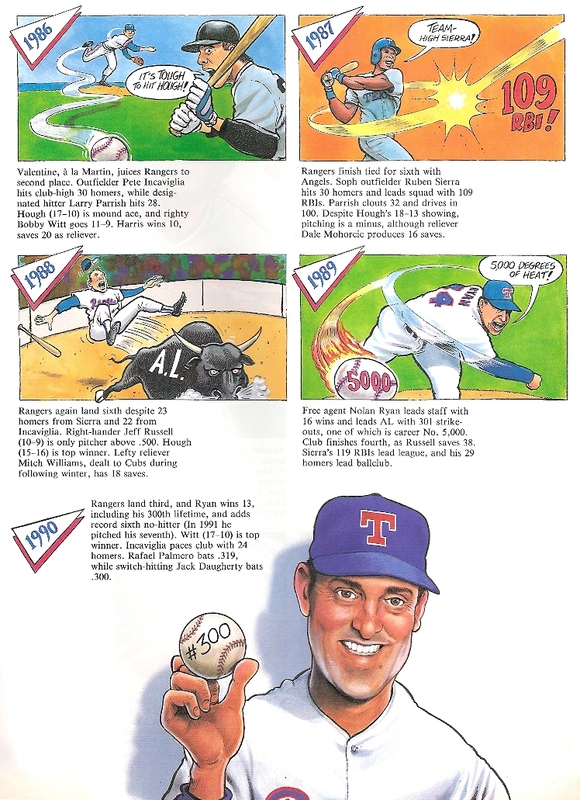 As I've mentioned before, I wish they would update the book - and sell it in trading card form! 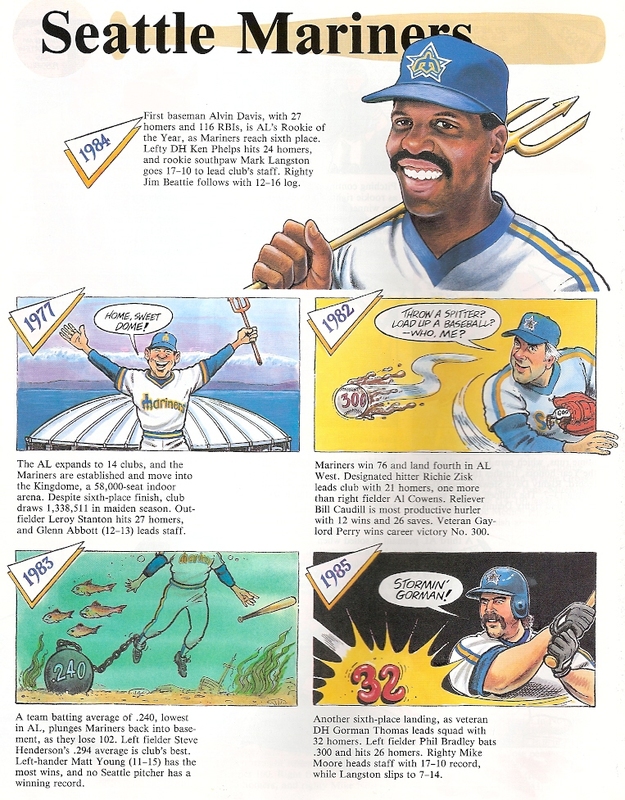 Today, we look at the Seattle Mariners. A team with a relatively short history and pretty much no success, the Mariners don't have much to write about. The team receives only two pages in the book, with only 5 panels per page. 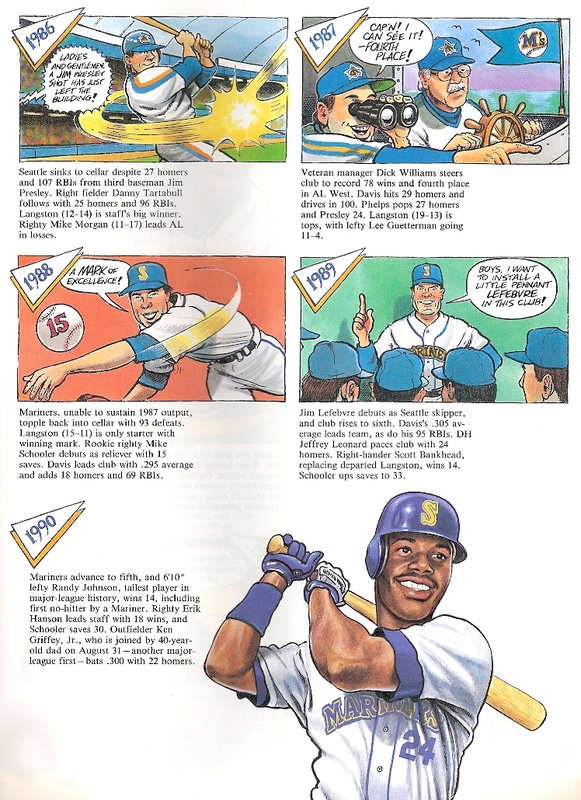 The highlight is Griffey, one of my favorite players. 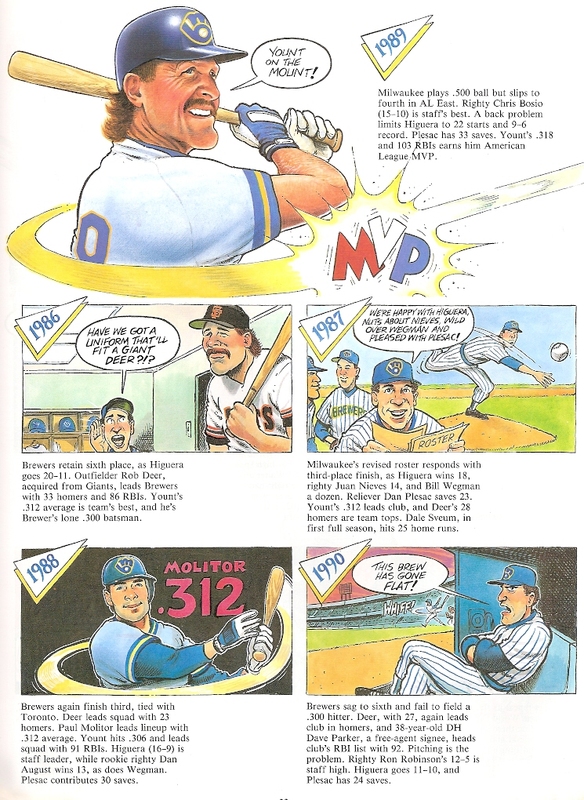 But the 1983 panel is pretty good, as long as you don't view it morbidly. I'm currently on vacation. 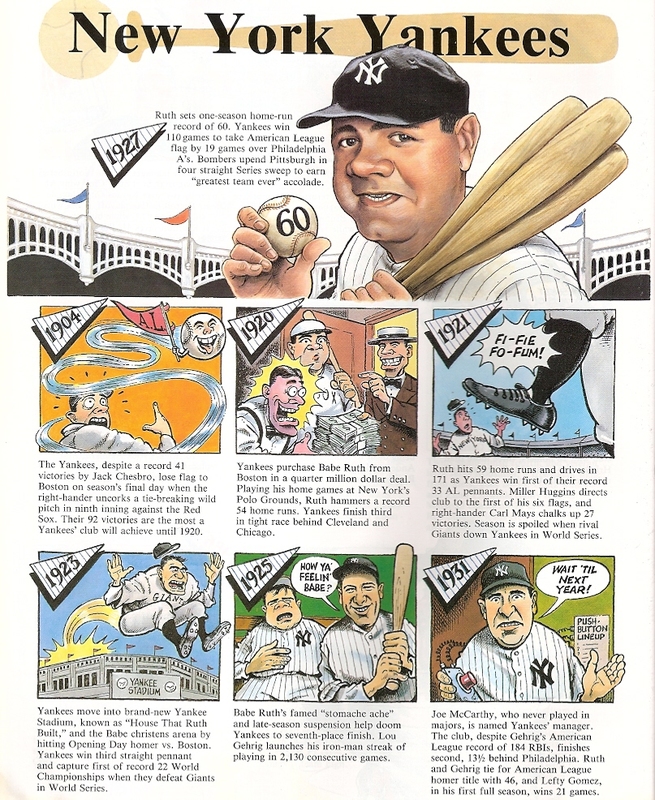 I figure this is a good time to share more from Red Foley's Cartoon History of Baseball. 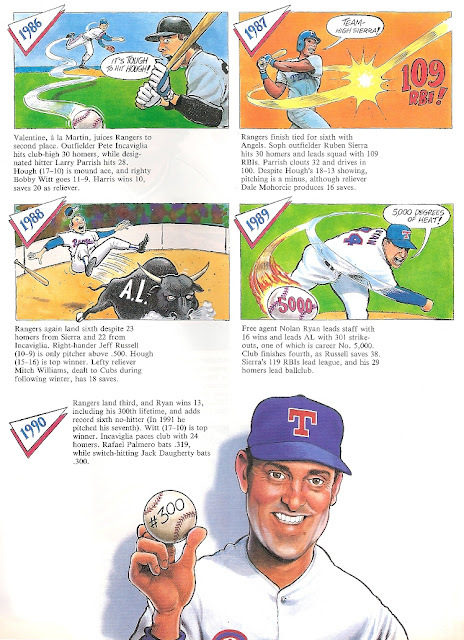 As I've mentioned before, I wish they would update the book - and sell it in trading card form! Today, we look at the Oakland A's. 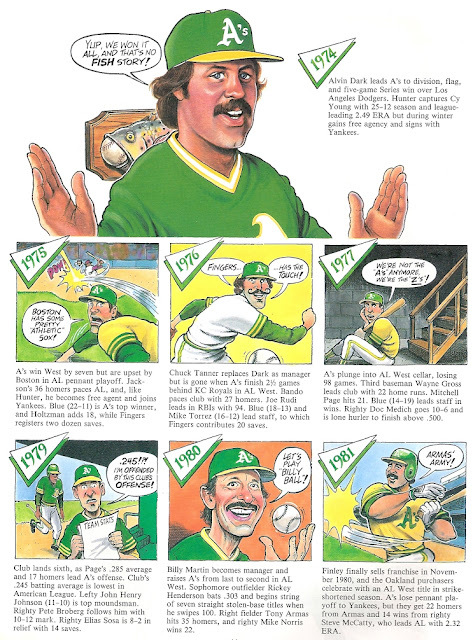 1977: The A's are so bad the cartoon panel references them as the Z's. The '55, '60, '68, and '73 cartoons are pretty good, but I really enjoy the panels highlighting LaRussa's team's rise to power (and the small footnote mentioning Henderson's stolen base record, possibly added in just before printing). I'm currently on vacation. I figure this is a good time to share more from Red Foley's Cartoon History of Baseball. 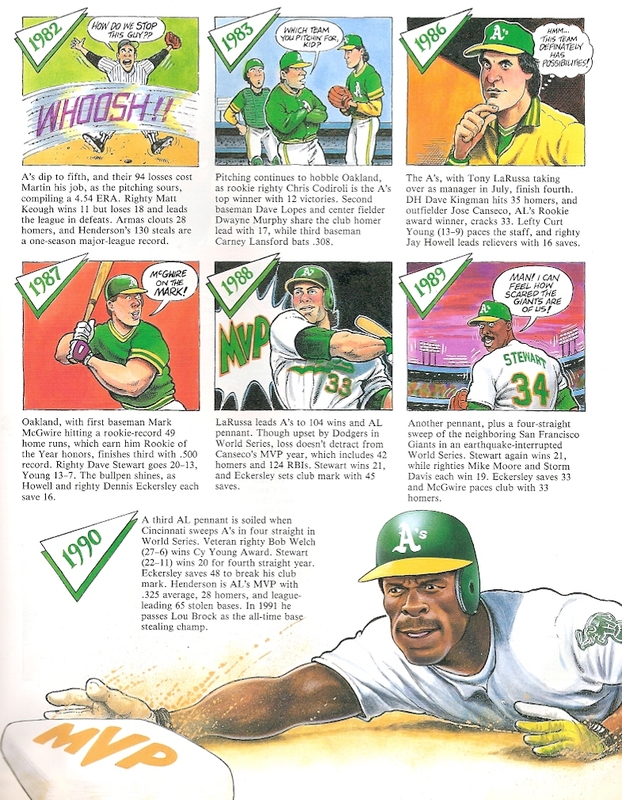 As I've mentioned before, I wish they would update the book - and sell it in trading card form! Today, we look at the New York Yankees. 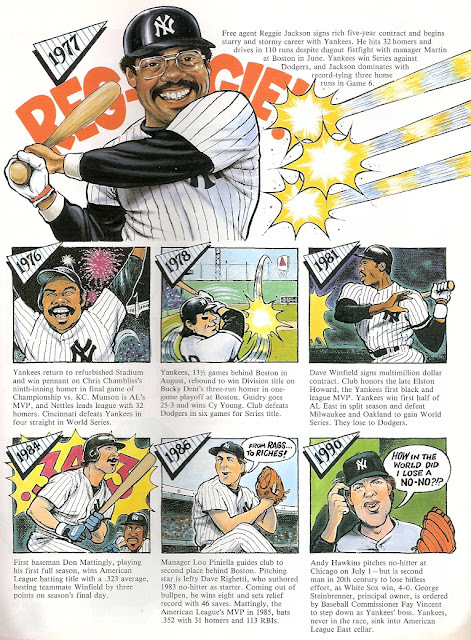 Despite the Yankees' struggles in the 1980s, they still are the team with the most successful history. There are very few years in the franchise's history that are included but not worth mentioning. 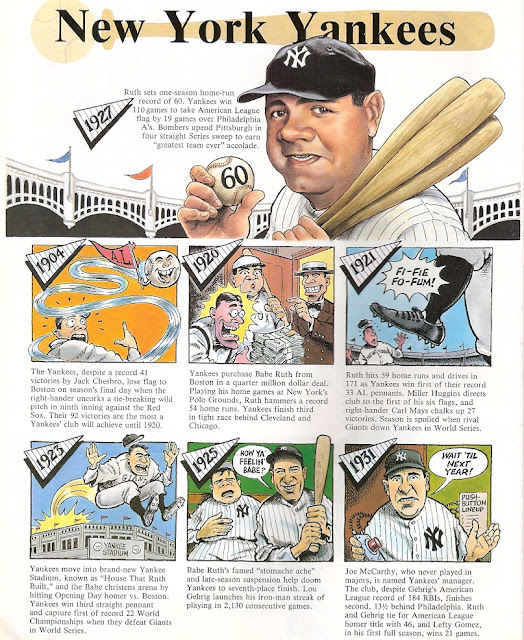 It's interesting to see that there is a very quiet period of time following the end of the Ruth-Gehrig era until Mantle and Maris got going. 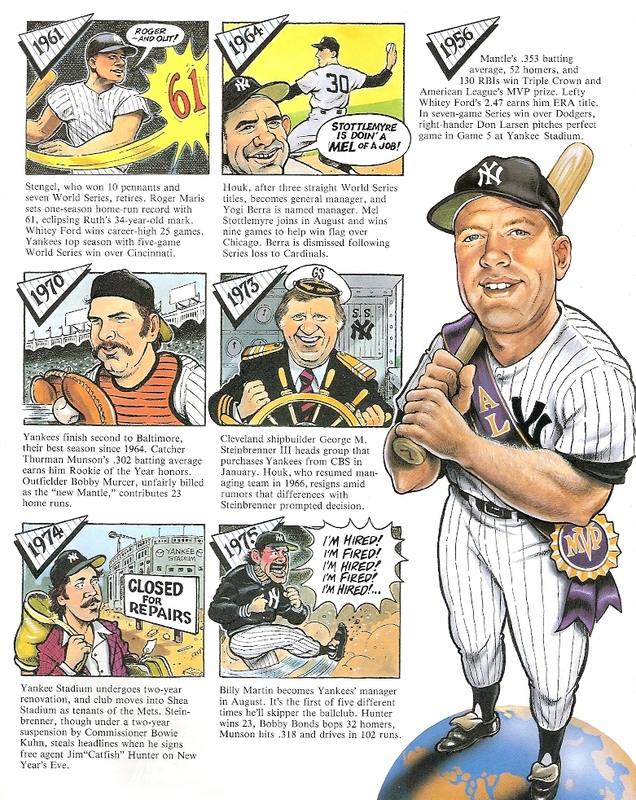 My favorite panel is the tribute to Gehrig, with the Ruth goodbye panel and boating Steinbrenner coming in second. Red Foley heads to the Twins' City. I'm currently on vacation. 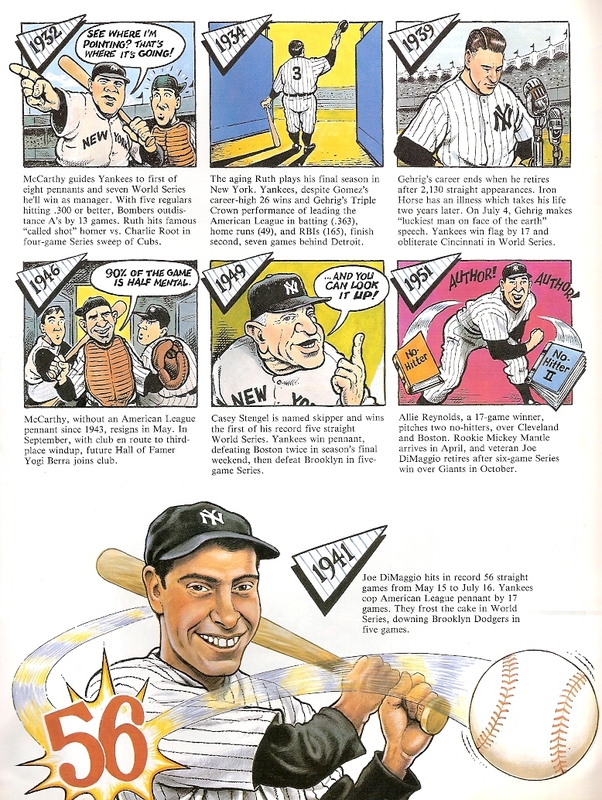 I figure this is a good time to share more from Red Foley's Cartoon History of Baseball. As I've mentioned before, I wish they would update the book - and sell it in trading card form! Today, we look at the Minnesota Twins. 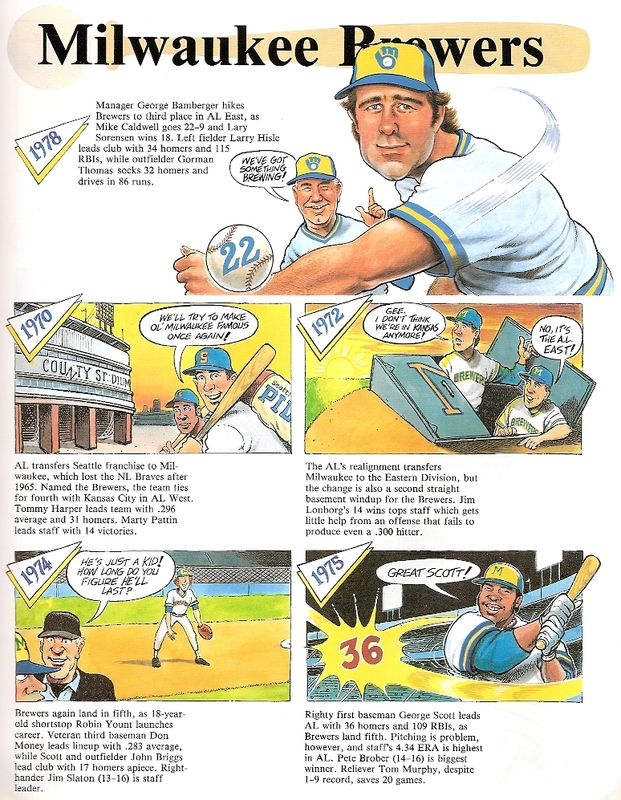 Kirby Puckett is a legend, but I really like the Hitchcock reference in the 1970 panel. 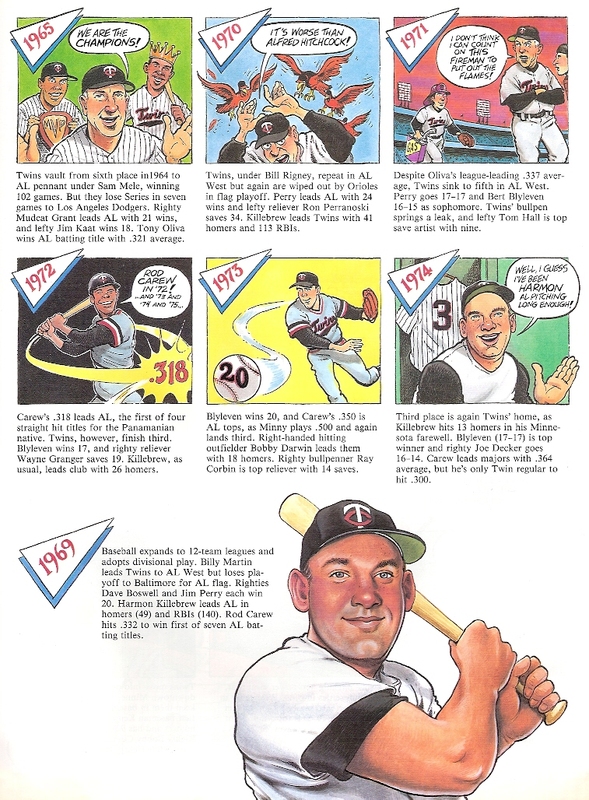 And unfortunately, the Twins have a history of poor performance, which is again reflected in the cartoons. A black hole for the pitcher's mound! 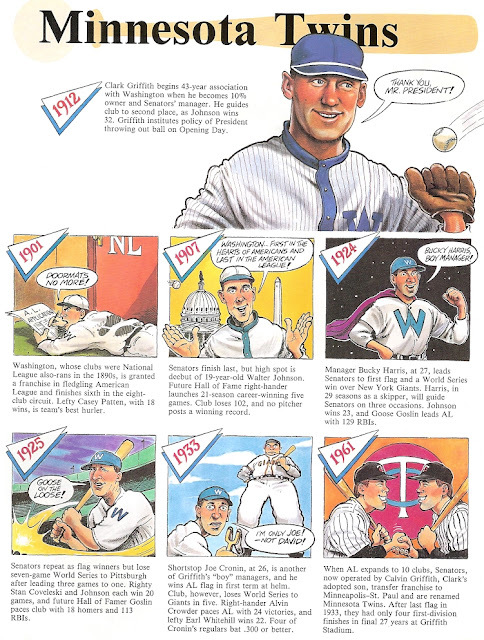 I am very happy with the inclusion of the Twins' history in DC. 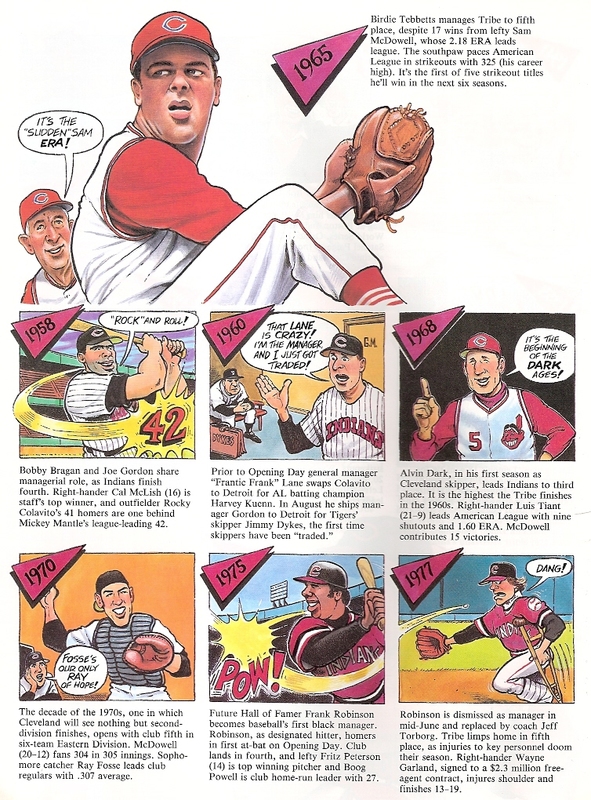 Why didn't they draw a cartoon caricature of a president throwing out the first pitch? I'm currently on vacation. I figure this is a good time to share more from Red Foley's Cartoon History of Baseball. 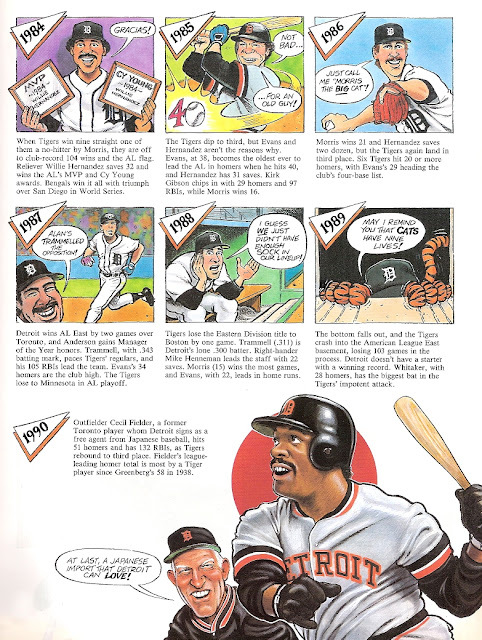 As I've mentioned before, I wish they would update the book - and sell it in trading card form! Today, we look at the Milwaukee Brewers. You gotta love teams with very little exciting history. 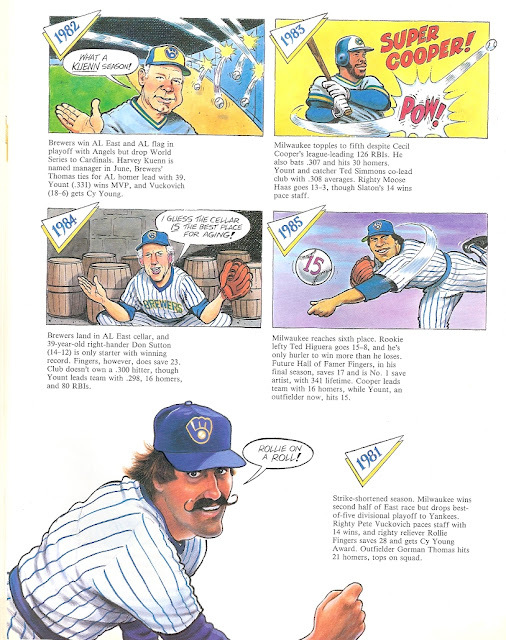 Like the Indians, the Brewers have multiple panels referencing horrible seasons at the bottom of the division. And they even managed to reference beer in a cellar. And flat beer. But my favorite panel is the superhero comic-style Super Cooper panel! I'm currently on vacation. 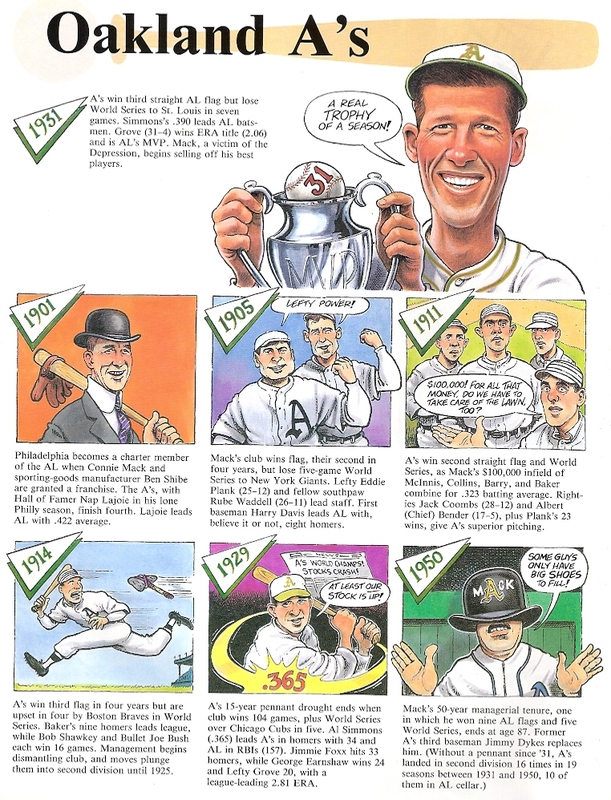 I figure this is a good time to share more from Red Foley's Cartoon History of Baseball. As I've mentioned before, I wish they would update the book - and sell it in trading card form! 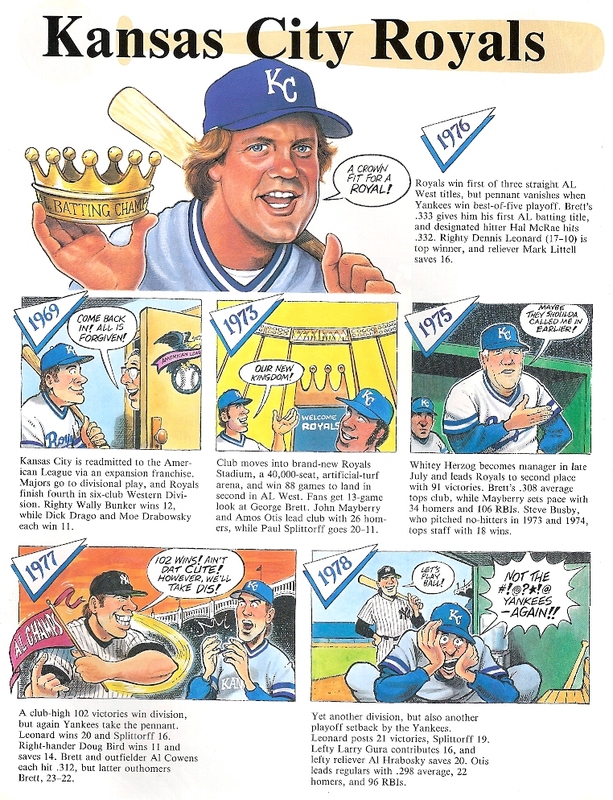 Today, we look at the Kansas City Royals. 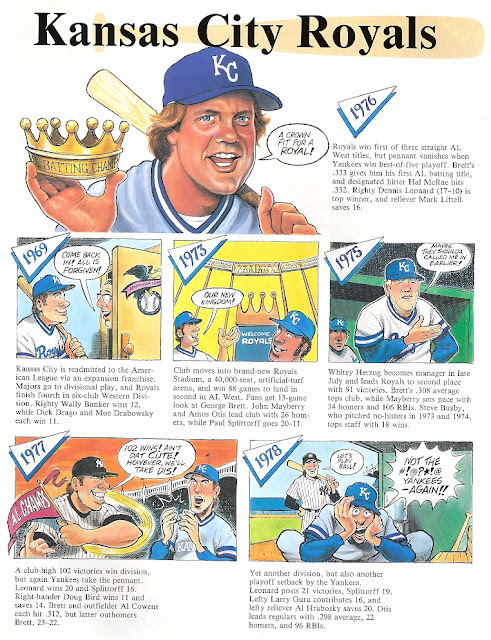 I have to say, the cartoon of George Brett in 1983 is pretty hilarious. The pun from 1987 is really bad, though. I'm currently on vacation. I figure this is a good time to share more from Red Foley's Cartoon History of Baseball. As I've mentioned before, I wish they would update the book - and sell it in trading card form! 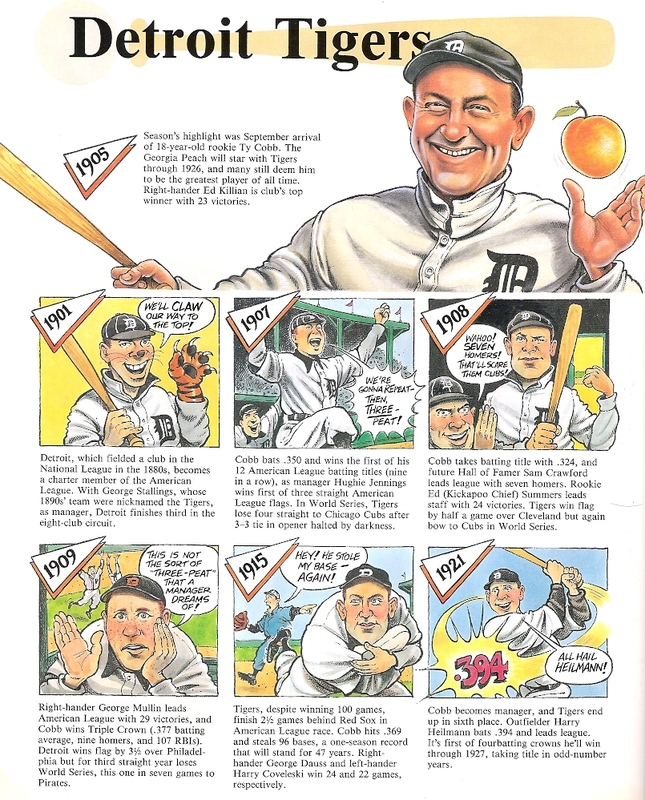 Today, we look at the Detroit Tigers. The Tigers have a long history, and since my aunt and uncle call Detroit home, I've been a Tigers fan since I became a baseball fan. I clearly remember going to games at Tiger Stadium. My favorite cartoon is probably the Cecil Fielder one. The panel recognizes Cecil Fielder's great year in 1990, his time spent in Japan, and even pokes fun a bit at Detroit's former industry. I'm currently on vacation. 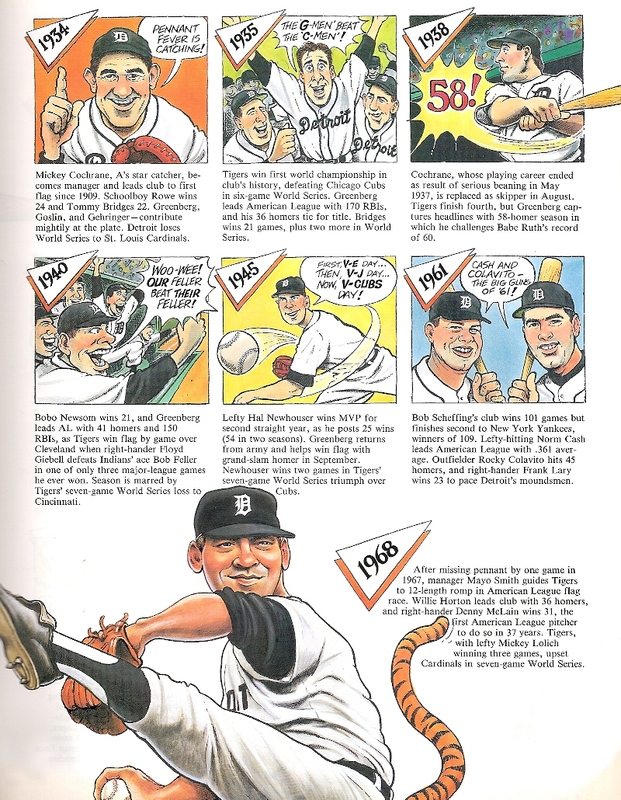 I figure this is a good time to share more from Red Foley's Cartoon History of Baseball. 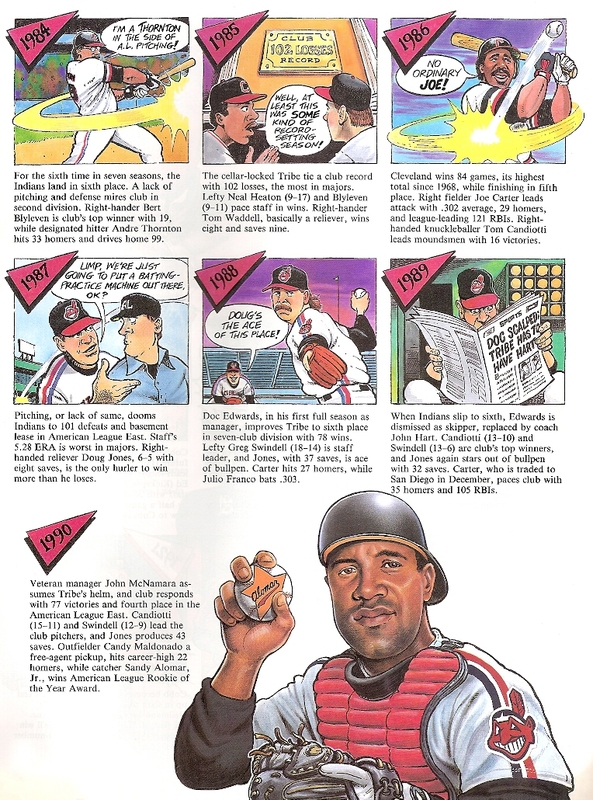 As I've mentioned before, I wish they would update the book - and sell it in trading card form! 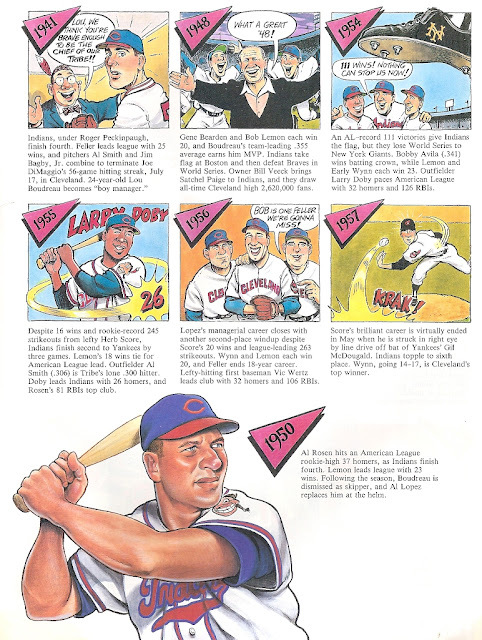 Today, we look at the Cleveland Indians. My favorite cartoon for the Indians is about 1960, only because it marks an interesting, obscure moment in baseball history. I haven't bothered to research: have other managers been traded since? An obvious theme is the consistently poor performance of the Indians, especially in the 1980s. 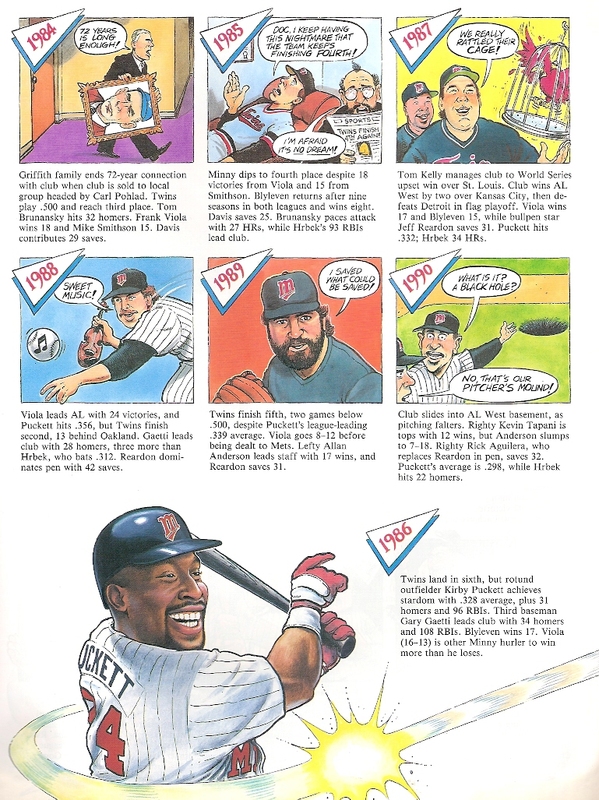 Of course, they were more successful in the mid-90s. As Gary Engel puts it, Calbee is the dean of card companies in Japan. For over 40 years now, they have been including one-card (now two-card) packs with potato chips. Unlike Topps, Calbee didn't publish checklists for a long time, and without card stores and dealers, collecting more than 1400 different cards per year (in a couple cases) meant buying a ton of potato chips and then having to trade duplicates. These days, collecting Calbee cards is easier - checklists are released beforehand and dealers are available to buy singles from to finish sets. But in 1973, kids had nothing but each other to go with. The 1973 set features color photographs with minimal text on the front. This card is of Katsuya Sugawara and the text is almost invisible due to his shoe and the shadow. It says his name in kanji; family name first and his team name again in kanji, in parentheses. Cards measure 2-3/8" by 3-1/8". The backs are royal blue (my scan is a bit light) with a crossed bat symbol at the top. The backs seem to all have a lot of text on them, and Engel says they are sometimes known as monoshiri (know-it-all) cards. I really like how the kanji includes kana to help with pronunciation. If I ever wanted to really practice my vocabulary or at least kana reading skills, I could translate the backs of Calbee cards! The top line says Pro Yakyu ?? Card in Japanese (yakyu is the Japanese word for baseball). The bottom of the card says Calbee in katakana and a pair of English letters. The first line below the crossed bats translates as Giants pitcher of third! Sugawara player. Player is used here as an honorific title, such as sensei. I'm not sure why he's labeled as "Giants pitcher of third" - he ended up with the second-most victories for the Giants that year but appears to have been usually used in relief - a duty he shared with a few other pitchers. Perhaps he was considered their number three pitcher overall. 1973 would be his last year, as over 6 games he had an ERA of 6.97 and who knows what happened to him after that. 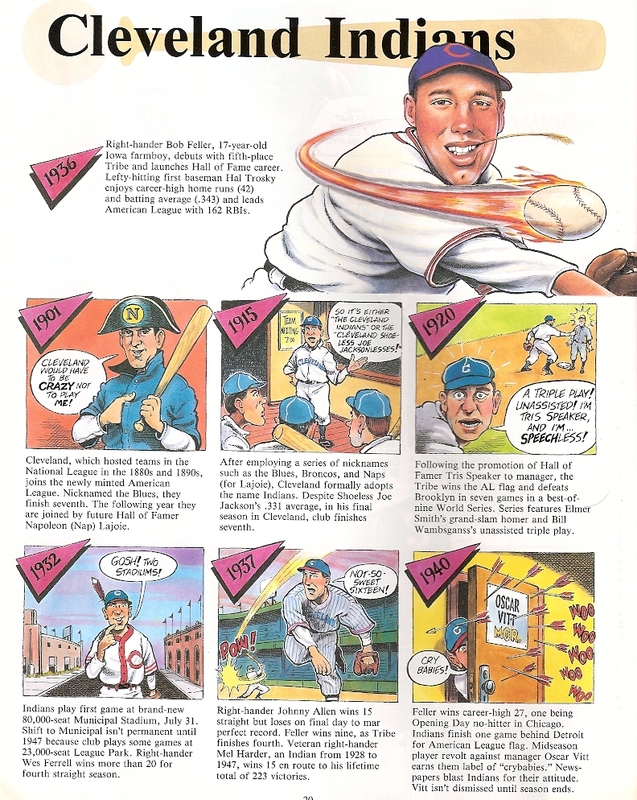 A homerun-back version of the cards has the word "homerun" in Japanese between two baseballs, below crossed bats. A date of August 30, 1973 is printed at the bottom. The 1973 set contains 91 cards, with the first six cards belonging to Shigeo Nagashima and the next six to Sadaharu Oh. After that, many other players have multiple cards in the set, so there are far fewer than 91 players featured. Many players have cards back to back. A quick glance shows Kazumi Takahashi has four cards total in the set: numbers 16 and 17, and numbers 43 and 44. There doesn't seem to be any actual reasoning for card numbers since not all cards for a player are in a row, but the cards aren't all randomly scattered either. Most of the cards are sorted by team. The Giants hold an overwhelmingly large portion of the checklist thanks especially to Nagashima and Oh. 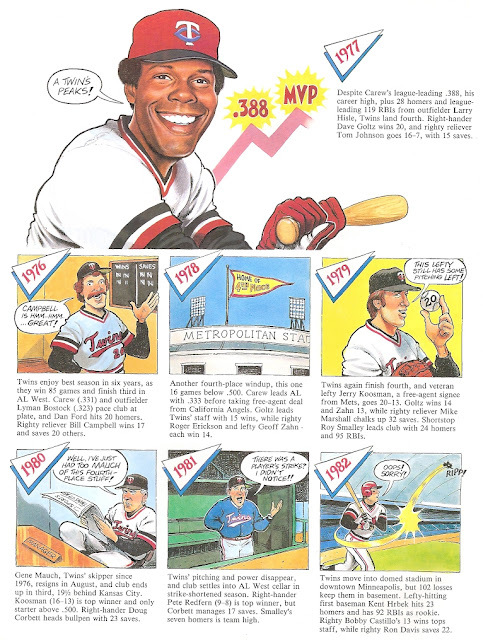 The checklist for the 1973 crossed bats set is identical to the first part of the next set (1973-74 issue). The fronts are usually identical; 1973-74 sets have a different back style than you see above. Sports Card Magazine, the Japanese price guide magazine similar to Beckett in the US, lists variations for cards 64-72. There doesn't seem to be any notation as to what the variations are; those cards are in italics in the checklist below. The "A" version of those cards carry a 50% premium in SCM. All those cards are of Dragons players, though two other Dragons cards in the set (#52 and 53) weren't changed. Further research indicates that the variations may only be which bat is on top in the crossed bats design on back; the left bat or right. I am assuming, because my card has a right bat on top, that the left bat on top is the scarcer version. Card #14 apparently has two photos, one with a horizontal orientation (pitching motion pose) and one with a vertical orientation (set position pose). The horizontally oriented photo was reused in the 1973-74 set. This is post 800. Wow. I can't believe I've written enough garbage to keep you entertained for 800 posts! This means that sometime next year I should hit 1000. A thousand posts. I've had to rethink my writing since moving to Japan, because I no longer have easy inexpensive access to cards (card shows here are nothing like in America) and when I do get new stuff it's usually sent to my address in the States. Showing lots of Japanese cards has still brought readers to my site, and hopefully my American view on Japanese baseball has proven entertaining. There is still so much I want to do on the blog. I'm getting much better at posting about new Japanese releases, and I'm thinking of creative ways of filling in the gaps when I don't have new cards to show. Thanks, as always, to all my readers out there - regular and sporadic - who find the time to comment on my posts and bear with me on long, drawn-out trade deals. Know that while it's much harder for me to comment now, I'm still reading posts through my iPhone while on the way too and from work, and at lunch! I thought I'd show you a few cards that show the wonderful connection between Japan and America. First, CardGen. I love CardGen, even though I haven't tried to put a set together (wouldn't that be awesome?). Here is a foil card of Brian McCann. CardGen is a Japanese card set of MLB players, made by Topps. It's designed to work with an arcade game but the cards stand out on their own. And that background CardGen logo is pretty cool in the scan. Here's the back. Foil cards are very limited releases. There are 60 cards in the foil set, so getting any particular player isn't easy! Here are a few Yu Darvish cards. These are from another gaming set called Baseball Heroes. Ichiro, Matsui, Nomo, and Darvish are national treasures in Japan - icons that show Japanese ball players can compete at the top league in the world. Japanese fans love the foreign players who come to Japan as well, though there are issues (see: Sadaharu Oh's single-season home run record). It seems that with greater success in the MLB, Japanese baseball accepts foreigners breaking records better (see: Matt Murton and the single-season hit record). With Balentin at 53 home runs (as of Tuesday morning in Japan) we'll see what happens as the last month of the season progresses. When I posted information about the foreigners set I mentioned BBM has been releasing a lot of topical sets this year. I've enjoyed learning from the Kyushu and Osaka Limited sets, and the history recalled in the two foreigner sets and the no-hitters set is great. Another series that BBM has been releasing this year has been Greatest Games. This particular set focuses on a game played on September 26, 2001 between the Buffaloes and BlueWave. The base cards are fairly simple and feature players from the game. I assume the photos are from the game as well, though I don't know for sure. 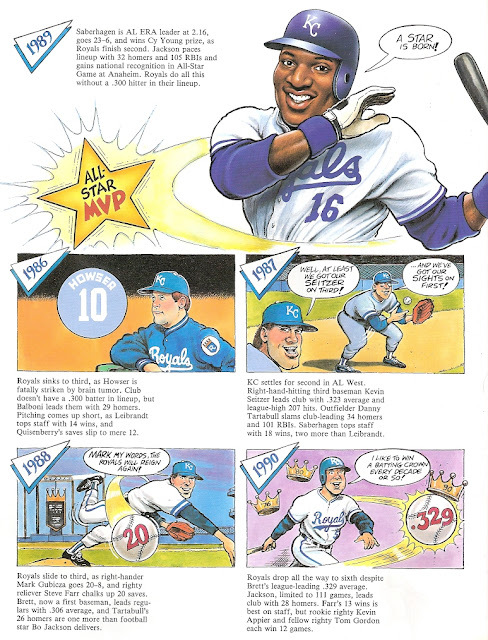 The backs have awards highlights, statistics for 2001, and a writeup about the player. Here's Tuffy Rhodes for comparison between the two teams. 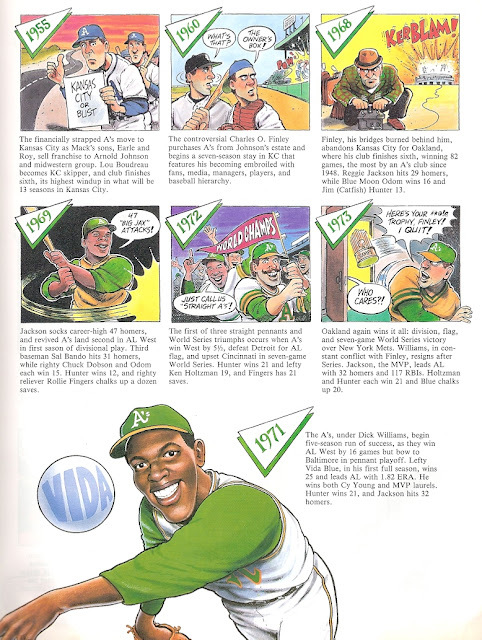 Again the backs have a listing of Rhodes' awards and achievements, 2001 stats, and a writeup. 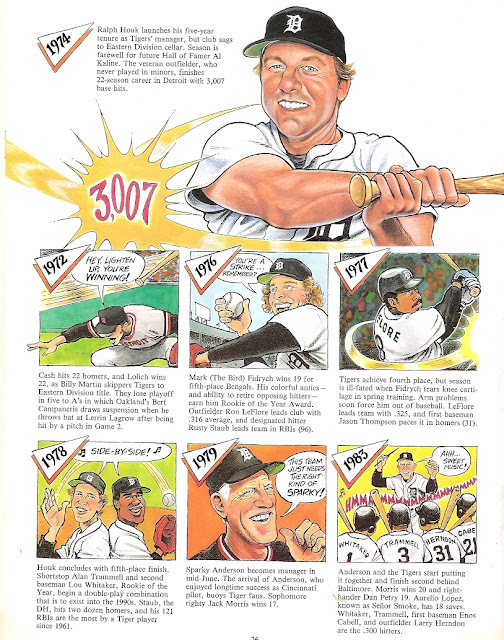 I don't know if it references the game itself, as the statistics include some of Tuffy's career numbers (464 HRs, 1269 RBI). The end of the set has several highlight cards. This one honors Rhodes' 55 home runs. The back seems to mention that Tuffy hit his 55th home run on September 24th, tying the record set in 1964, and that the record was tied again in 2002? Obviously, the set doesn't focus entirely on the actual game. It looks like there are 29 players in the autograph list (about half for each team), with quantities ranging from 31 to 127. I couldn't find information on any other special cards being issued in this release. Watch the entire bottom of the ninth with this 10-minute video, or jump to 8:30 for the end. Soon after the release of Kyushu Limited, a set that focuses on players from the major southern island of Japan (and home to the Softbank Hawks), BBM issued Osaka Limited. The set is titled Naniwa Tamashi (Naniwa Soul); Naniwa is the place that eventually became the city of Osaka, so the name (for those in the know) implies heritage or history. I'm not sure why they used katakana instead of hiragana for the name Naniwa. The players in the set are from the Osaka area, including those who went to school there. The base cards use a white border and feature standard BBM photography. The Osaka Limited set logo is in a lower corner. Cards 1-69 are active players, 70-72 are dual-player cards, and 73-90 are Legend cards with the same design as the base cards except for a Legend designation in the lower left corner. The dual-player cards seem to be called "Active Classmate" and have players that played at the same high school together for all three years. Yes, high school in Japan lasts only 3 years (9th grade is part of junior high). Unlike the Kyushu Limited set, Osaka lacks a map showing you where in Osaka the player came from. I guess that's okay - Osaka isn't as big as Kyushu. I'm not sure if the text lists anything about the player's connection to Osaka (high school, district, etc), but that would be great to include. Cards are numbered at the bottom and all cards in the set carry an [OSAKA LIMITED] mark on the copyright line. As far as I can tell, only a gold-signature parallel was issued. I don't know how many - or which - cards were paralleled. The backs are identical except for serial numbering /150 at the bottom. A nine-card All Osaka First Team set is the only insert issued, and it appears that there are no parallels for the set. They feature blue lettering and foil backgrounds. Kenta Maeda is from Osaka and appears in both the regular and insert set. The backs have blue tints and cards are numbered with an OT- prefix. Not much information is on the back, and the photo is the same as the front. There are two autograph sets with identical layouts. Active players (49 different by my count) are numbered from 10-40 copies each and use a more concrete-color background design. The retired players (16 players) are numbered 30-100 copies each and have a more tannish color to the background.